legal approach to fit your needs. For more than 20 years, attorney David Rankin has been helping residential and commercial real estate clients in the Tampa area navigate the process to a smooth and successful transaction. Additionally, for over 30 years, Mr. Rankin has represented countless licensed professionals throughout Florida statewide appear before their licensing board when called for proceedings. Whether your legal needs involve Tampa area real estate or Florida administrative law, David Rankin is an attorney you can trust to help you through. Contact experienced Tampa real estate & administrative lawyer David P. Rankin today. 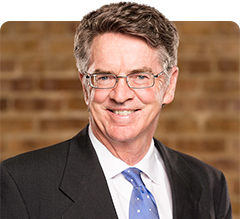 David Rankin has been representing licensed professionals and businesses since 1985, and before then he prosecuted licensed disciplinary matters for the Department of Business and Professional Regulation. David has the depth of knowledge in administrative proceedings and the breadth of experience across a range of professions – including but not limited to professional engineering, accounting, veterinary medicine, real estate, mortgage broker, insurance sales, insurance adjuster, funeral director, physician, nurse and any other vocation or business for which the state issues a license – to help you achieve the best possible result at the earliest possible stage. If we cannot obtain a dismissal of charges during the investigative phase, we will provide a strong defense in your administrative hearing and also appear before the licensing board or commission to advocate for a positive result in your favor. The Law Offices of David P. Rankin maintains a practice devoted to assistance in Tampa area real estate transactions, and the representation of licensed professionals in administrative proceedings in Tallahassee and throughout Florida. Below is a brief overview of how attorney David Rankin helps clients in these fields. Click on a topic heading for more detailed information about the work of our firm in these main areas. Whether you are involved in a residential or commercial real estate purchase or sale, a real property transaction is likely to be the biggest single investment you make as an individual or business, not only in terms of money but also in terms of the time and effort which goes into a successful deal. For the buyer, there is an intensive search for that perfect piece of property, the difficulty of obtaining financing, and negotiating a purchase at a price you can comfortably afford. Sellers meanwhile put a tremendous amount of sweat equity into readying a property for the market, qualifying a prospective buyer, and making any additional modifications or repairs that may be required. With so much work going into making a transaction happen, it is truly a tragedy when the deal falls apart due to title or boundary issues or the failure of one party to fulfill its obligations. The Law Offices of David P. Rankin provides comprehensive assistance to buyers and sellers in residential and commercial transactions to help ensure that the process goes smoothly and the deal concludes successfully. From resolving title issues and writing title insurance, to obtaining financing or resolving claims, and personal representation at closing, our firm is here to help see your real property transaction succeed, as we have been doing in the Tampa area for 20 years. Our firm engages in the representation of licensees such as engineers, accountants, dentists, pharmacists, nurses, veterinarians and real estate brokers. If you have an administrative action filed against your professional license by the Department of Business and Professional Regulation in Tallahassee or any other licensing board or agency, count on the Law Offices of David P. Rankin to serve as a staunch advocate on your behalf. Attorney David Rankin worked for several years as a former prosecutor with the State Attorneys Office in Hillsborough County, and after that spent several years in private practice where he received cases for prosecution from the Department of Professional Regulation (now the Department of Business and Professional Regulation). David eventually turned away from prosecuting disciplinary cases, and since 1985 has been representing licensees throughout the state of Florida. For assistance in any administrative proceedings, including applications and denials, and formal evidentiary hearings (trials) where your license and your livelihood are on the line, count on the Law Offices of David P. Rankin for advice and representation from one of Florida’s most experienced and successful administrative license attorneys. David Rankin has been handling residential and commercial transactions for buyers and sellers of real property in Tampa for 20 years. As the owner of a title company, David knows all the issues that can arise before, during and after a real estate transaction. Our firm works to resolve any issues which are present and structure a deal that meets your needs and prevents any problems in the future which could arise from a less-diligent or thorough approach. Real estate transactions can be complex, with many steps involved and many pitfalls that must be avoided to ensure a successful purchase or sale. If you are buying or selling a home in Florida, you probably have lots of questions, especially if this is a new experience for you. Below are answers to some of the questions most frequently heard by Florida real estate attorney David Rankin as he advises and represents buyers and sellers in residential and commercial real estate transactions in the greater Tampa area. Hopefully, the questions you find here are the same ones you have been asking yourself. If you have other questions or need to talk to an attorney about a Tampa real estate matter, contact The Law Offices of David P. Rankin at 813-968-6633. If you purchase property that turns out to have problems with the title, title insurance can indemnify you for financial losses that result, or cover the cost of defending your title claim in court. Title insurance covers situations such as undisclosed defects or other unforeseen problems that were not revealed by a title search but could end up damaging your rights to ownership. Title insurance is not required by Florida law, but most often the lender will require that title insurance be in place as a condition of making the loan. Does the buyer or the seller pay for title insurance? Like most closing costs, who pays for what is negotiable. Typically, the seller pays the cost of the title insurance, since the seller is the one promising to deliver a clear title, but market factors and the particular transaction may influence which party pays for the title insurance and other costs of closing. What kind of facts about the home I am selling do I have to disclose to potential buyers? According to the Supreme Court of Florida in Johnson v. Davis, the seller has a duty to disclose any facts known to the seller which materially affect the value of the property that are not readily observable and not known to the buyer. This could include defects and problems with the home such as termites, sinkholes and Chinese drywall, or problems with the property title, such as boundary disputes, claims against the property, or homeowner association restrictions. Since the law in this area is rather vague and open-ended, it is best to share any concerns with your lawyer before you decide to disclose or not disclose what might be a relevant fact. If you are the buyer, make sure you have a photo ID with you. You should also bring along a copy of your valid homeowner’s insurance policy. Another important item to bring is of course the money due at closing. This should be in the form of a cashier’s check that is made out to the seller or the seller’s lawyer. For security purposes, you could also have the check made out to yourself, and you can endorse the check over to the seller at the closing. If you are the seller, you should also bring a photo ID, as well as the deed to the property and mortgage information for the buyer’s attorney. Other important items include the final meter readings on all utilities, as well of course as all the keys and garage door openers that go with the house. You should also bring proof of compliance with Florida laws on smoke detectors and carbon monoxide alarms. Your attorney will let you know if there are any other specific items that should be brought to your closing, such as homeowner or condo association material. The information on this website is designed to answer your questions and give you an overview of the issues you may be facing in your real estate or administrative matter. For more information, or for immediate assistance, call the Law Offices of David P. Rankin today at 813-968-6633. We look forward to the opportunity to help you achieve success with your most important legal needs.